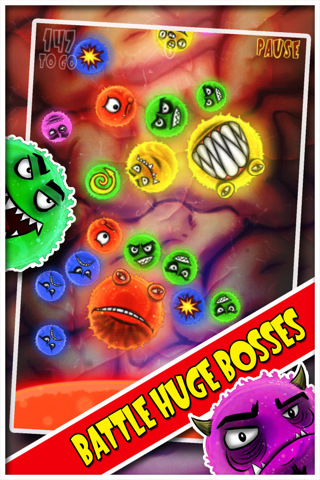 Immuno, from Outbreak Entertainment, is the latest in a long list of puzzle games for the iPhone and iPod Touch my poor colorblind boyfriend will never be able to enjoy. A fast-paced action puzzle game, Immuno is a bit like a combination of Bubble Bobble and Space Invaders, but all wrapped up in shiny graphics with a slightly sadistic charm. There’s no real story to speak of, but from the brief tutorial, you can gather that you are supposed to be fighting off an approaching disease, puzzle-game style. Round, brightly-colored viruses are bearing down on you with gleefully menacing faces, and your only defense against these infectious forces? A glowing, color-changing, uh, antibody pool at the bottom. Fancy terms aside, this is straight-up Bubble Bobble territory, and you’ve almost certainly played similar games in the past. To play, when the color of the pool matches the virus, you can flick matching antibodies at the virus to destroy it. If you’re quick, you can fire off multiple shots, but you have to be careful about your aim, because if you miss, your stray antibody will turn into a fresh virus. Unlike Bubble Bobble, viruses aren’t attached or affected by one another, and they’ll start to multiple over time. The viruses are always slowly moving downward, and if they reach the bottom, it’s game over. 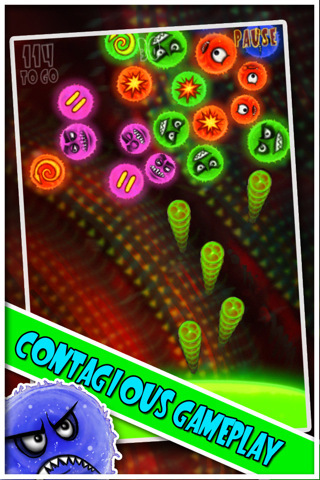 As you progress through the levels, bonuses start to appear, but the viruses start getting tougher, and it takes multiple shots of antibodies to destroy them. Unlike many games of this type, it’s impossible to predict which colors are coming up, so you really have to move fast to get off as many shots as you can. There is no real aiming mechanism aside from your eyeball and finger, so things can get a little ugly at times. The touch sensitivity of the controls isn’t terrible, but it would definitely benefit from some tweaking, so you can expect some random misfires. By no means would I call Immuno an especially creative game, but it delivers a reasonable Bubble Bobble experience for the price. The bouncy and slightly sinister music suits its background nature, and the graphics in particular are quite nice, with clean menu screens and appropriately evil looking viruses, but the game doesn’t provide a lot by way of variety and the pacing lags a bit. Levels start to drag pretty early on, and it’s hard to find a comfortable casual playing rhythm. There are a number of Open Feint achievements and an endless “Challenge Mode” to keep things competitive, but they didn’t really add a whole lot to the experience. Overall, Immuno isn’t a bad game. It’s a trifle bland and on the generic side, but thanks to shiny graphics and an overall profession finish, it still manages to be a decent distraction for $0.99. Nothing outstanding, but still fun for a few minutes here and there. AppSafari review of Immuno was written by Tracy Yonemoto on April 13th, 2011 and categorized under Action, App Store, Arcade, Games, Physics Based, Puzzler. Page viewed 3910 times, 1 so far today. Need help on using these apps? Please read the Help Page.